Few English vessels were so well known in Auckland as the Famenoth, and very few skippers had attained to such a degree of popularity in shipping and other circles of the community, as had Captain Auld, her worthy skipper. The Famenoth was a fine roomy ship of just upon 1000 tons and was chartered by the Shaw, Savtll and Albion Company. Generally, the Famenoth experienced unusually fine weather on the passages out to New Zealand, but owing to the prevalence of light winds and calms she never made any remarkable runs. 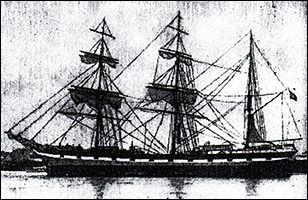 Captain Auld stated that his ship had never had an opportunity of showing her sailing qualities. On the voyage out in 1877, he reported that the passage had been so fine, that the topsails were not reefed once from the time of leaving the Channel until arrival in Auckland. Similar conditions prevailed on the run out in 1879, the ship on several occasions logging only from 25 to 30 miles in 24 hours. During the month of March 1882, gales of unusual severity were experienced along the English coast and proved most disastrous to shipping. The Famenoth was one of the unfortunate ships to be driven ashore. At the time, March 26,1882, the vessel was in the English Channel and was stranded at Whitstable, near Margate. Most, if not all, the crew managed to reach the shore. A cable to Auckland stated that five of the crew were missing, but this was not confirmed. Nearly a month later the Famenoth was refloated and towed to the docks, and after repairs had been effected she sailed for Auckland at the end of September the same year. From an article in the New Zealand Herald. 16th January 1883. As we anticipated in our yesterdays issue the barque* signalled throughout Sunday Last turned out to be the Famenoth from London with cargo and passengers. When the Famenoth last visited this port she came as a ship, but upon the present occasion her visit is paid rigged as a barque and for ourselves we think the alteration has added to her general appearance. Excepting is the altered rig, no indication is left of the accident the Famenoth met with on her last homeward voyage, she having been thoroughly repaired and generally overhauled whilst in dock at home. The barque has arrived in harbour in the pink of condition which reflects very highly upon our old friend Captain Auld and her Officers. Her voyage has been a somewhat protracted one of 111 days and throughout has been devoid of interest of special note. If we may except that bugbear of shipmasters, "cargo broachers". Captain Auld has not been free of these upon the voyage just ended, and the conduct of four of his crew has been such that he was compelled to give them into custody shortly after the anchor was dropped, yesterday morning. As in the instance of all the other English vessels which have recently arrived here, the Famenoth's passage a long fine weather one, no heavy weather of notice being met with. All the passengers have arrived in good health and were under the medical charge of Dr. Caldwell, who appears, from the general expression of his charges, to have given every satisfaction in his department. The passengers too, speak very highly of the general management of affairs, and of Captain Auld, who appears to have left nothing undone that could conduce to the general happiness and comfort of his valuable charge: And his efforts have been well seconded by his officers. One birth occurred on the voyage, Mrs. Wymar being safely delivered of a son on the 13th instant. Of the voyage Captain Auld reports having left London on the evening of 25th September last and Gravesend next afternoon. Dirty weather, with W.S.W to W. N. W. winds met with in working down the English Channel. Discharged pilot off Plymouth on October 2nd at 8 p.m by which time all the passengers had fairly settled down to the stern realities of the long sea voyage before them. Very unsettled weather prevailed until sighting the island of Madeira on the 13th of the same month.. Crossed the Equator on the 4th of November, the NE trades here proved exceedingly light and unsettled. Took the S. E.trades off the equator in long. 26.58W, they proved good and steady carrying the vessel to Lat 22S. Light variable winds then prevailed and were held until making the New Zealand coast. Gough Island was sighted on the 20th November and on the 30th of the same month the Cape of Good Hope was rounded. Passed the Crozet Islands on the 7th December, distance 15 miles. Crossed the meridian of Tasmania on the 27th and sighted the Three Kings at 4 a.m on the 9th inst and was abreast of Cape Mame Van Diemen light on the evening of the next day. Until Tuesday last had light airs; thence S.W. ? to arrival. During yesterday a large number of passengers came on shore and it is expected she will be cleared to-day. A notice to consequence appears in our advertisement columns, informing them that the agents will pass a sight entry to clear the vessel at 3p.m tomorrow, Messrs Cruickshank and Co are the agents. *Note: A barque is a sailing ship of three or more masts, the rear (mizzenmast) being rigged for a "fore-and-aft", rather than a square sail. The fore-and-aft sail is usually triangular, and is set completely aft of a mast or stay, parallel to the ship's keel and takes the wind on either side. The main sail always has a boom, pivoted on the mast. High Water to-day - Auckland 11.45 to 0.0. Manakaal .40-2.56. Moon. Third quarter to-day 0.20pm. Barque from London, Auld, Passengers Below W. F. Marbar, Mrs. Marbar, A. W. D. Marbar, A. D. A. Marbar, Mary Findley, Emily Findley, Horace Findley, Joe Malville, Wm. C. Malville, John T. Malville, Margaret B. Malville, Jacob Cathay?, D. J. Coeyore, John Gifford, Mrs. Gifford, Daisy Gifford, Violet Gifford, Mrs. Hoetell?, Wm. Earp, W. H. Earp, Ada Warren, First Dr. J. A. Caldwell, Second cabin Thos Carloe, Sarah Carloe, Thos Carloe, Mary Carloe, Sarah Carloe, John Pearman, Mary Pearman, Maria Ada Pearman, Richard James Harry, John Frostyoke, Edward Carter, W. J. Rostell, A. K. Clifford and Miss A McCracker. Steerage. Isaac Wymar, Elizabeth Wymar, Harriet Wymar, Laura Wymar, Elizabeth Wymar, Geo Day, Mrs. K. Day, Mary Smith, Joe Lockwood, Mary Lockwood, Alice Lockwood, Ruth Lockwood, John H. Edwards, Rose Franklin, Richard Butler, Mary Butler, Ellen Butler, Chas Butler, Wm. Butler, Harry Butler, William Fitzgibbon, Peter Haslop, William Knight, Anna Knight, Albert Knight, Sarah A. Knight, Enoch Knight, Charles Knight, Beatrice A Knight, Alfred Bomber, Oliver Croft, Charles Lees, Albert Radford, J. Hiand, Alfred Jarrold, Edwin Turley, H. M. Turley, Albert W. Turley, Sarah E. Haines, Jane Grice, Alice A. Gilow, George Harvey, Annie Harvey, Minnie Harvey, Charles Jones, Selina Jones, Selina Jones, Thomas Jones, Lillian Jones, Charles Jones, William Jones, James Jones, Jane Neild, Joseph Bayes, Mrs. A. Bayes, Miss Annie Bayes, Master J. W. Bayes, Master Arthur Bayes, Peter Gumrell, Ellie Sullivan, Thomas Brown Twite, Mrs. Augusta Twite, Thomas B. Twite, Arthur C. Twite, Alice A. Twite, Edith A Twite, Albert J. Twite, Ernest E. Twite, Charles Farnsworth, and Sarah A. Wyatt. - Cruickshank & Co Agents.